Yay! You found a good one. Nay! It's time you drop this one. 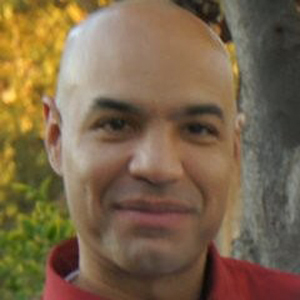 I use NameWorth for every purchase and sale I make, and I've been domain investing for over 15 years. For the cost of 1 domain renewal, you can make your business THRIVE. Not Ready? - Try Free. Can it really appraise my domain values? Yes. NameWorth is in-the-ballpark up to 95% of the time. For valuable domains, no one comes close. Take a look. While we were off by half, we are still within the range of what we call "in-the-ballpark". What is "in-the-ballpark"? We consider a price "in-the-ballpark" when you can double it or half it and still come up with the sales price. In this case, CBDOil.com recently sold for $500k, and we estimated $250k. Double it and we are there. CBD is an extremely hot market, similar to crypto and AI. When a domain is in an ultra hot market, the seller may opt to double or triple the NameWorth value if the domain is industry defining, as it is here. What you don't want is to take BAD advice. Join hundreds of professional investors and sign up for your NameWorth account today. What do investors like you say? 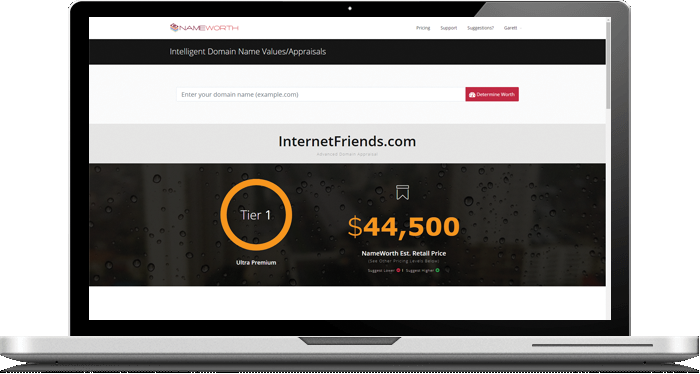 We use NameWorth for every domain investment decision that we make. It is great getting a "second opinion" any time we need it. We used the beta version of NameWorth to purchase over 1,000 domains last year. Our sales from the first year returned close to double our initial investment. How has NameWorth helped you? 1. Can I try your service for free? Yes, we do offer up to 5 free lookups per day, with a maximum of 20 free lookups per month. This is usually enough to try out the service and see how everything works. Once you are ready to take your domain business to the next level, we suggest signing up for a Hobbyist or Gold plan to start increasing your revenue, and decreasing your expenses. 2. What benefits do I receive from upgrading to a paid account? A paid account will let you look up hundreds, or even thousands of results for a very low price. You can also save huge amounts of time by using the bulk upload tool, which can price many domains at the same time. Users who upgrade to paid accounts find many uses for the NameWorth service. You can use it for all of your buying and selling activity. In addition, you can use it to periodically check if any of your domains have increased in value. Startups are launching all the time, wouldn't you want to adjust your prices when demand increases for your domain? 3. How can I increase my revenue by using NameWorth? We give you the insight you need to price domains like professional investors. In combination with your own business knowledge, you can use NameWorth as a "second opinion" to help you find the most valuable domains to purchase, and which domains you own that could potentially be worth much more than you think. 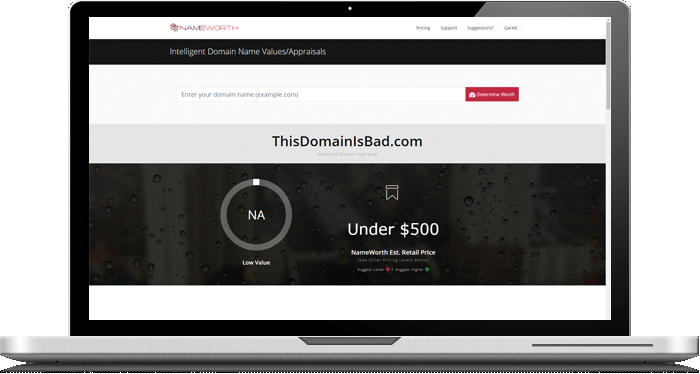 NameWorth helps you price your domains more accurately, helps you buy better domains, and increases your chances of getting bigger domain sales. If you are buying investment domains and the tool let's you know that 1 domain might be worth $2,450, and a different domain could be worth up to $19,000, how valuable is that information to you? 4. How can I decrease my expenses by using NameWorth? We are domain investors and can speak from experience. In the last month alone, we saved $301.85 by dropping 35 of our worst domains that were due for renewal. We never felt great about these domains and just needed someone or something to tell us that it was probably a good idea to get rid of them. But in the back of our minds, we kind of knew it all along. Lucky for us, NameWorth flagged these names as low value and we decided to let them drop. What did we do with our new stack of cash? We reinvested it in 2 monthly payments for a new brandable 4 letter domain we bought for our future project for unique lighting. The domain is lumr.com. "Lum" is a common prefix for lighting brands and product names. This worked out perfectly for us, and we think it is the ultimate name for our project. Even if we sell it instead of developing a site, I expect that we could easily get $20,000 if we wait for the right buyer. The best part? It was paid for by the absolute worst domains we owned. What have our worst domains ever done for any of us? From using the method above, we are are on track to save over $3,620 on renewals this year. Imagine what your business would look like 2-5 years from now if you consistently exchanged your absolute worst domains, for 1 great domain every couple weeks. You would have an amazing collection of great domains. I don't know how you feel about it, but for us a $20,000 sale makes a huge difference in our business and opens up new opportunities when a big sale like this comes through. 5. I only own 50 domains, should I wait until I have more domains before I sign up for a paid plan? Based on what we've found, even if you only have 30-40 domains, when you sign up for our Hobbyist plan at $9.99 per month, you will likely save more than this amount every month if you make just a minimum effort. By actively reducing your expenses and dropping domains that are less likely to sell, you'll typically save more than enough to pay for the service. You can then use this new money and the NameWorth service to find much better domain names. If you do this for a few months, you could very well be on a much different business path with the help of the NameWorth service. If you just starting out, it is the perfect time to sign up for NameWorth to help you buy better domains right from the beginning. 6. How accurately can you estimate the value of my domains? After over 10,000 manually checked tests, NameWorth has been fine tuned to be the most accurate appraisal tool that we've ever seen. In our testing, for English based domain names and brandable domains, the tool is accurate up to 95% of the time. There are still anomalies, but by mid to late 2019 we expect the tool to be extremely accurate and are striving to get to over 95% accuracy. 7. What if I change my mind? Don't worry, all of our products are backed by a 30 day money back guarantee and a full refund is given if you've used less than 100 lookups. If you've used more than 100 lookups, and want to permanently cancel your account, the refund will be pro-rated based on the use for the current month. For example, if the product did not work as expected and you used half of the credits, you could receive a refund for the half of the credits that have not yet been used if you felt there was something wrong with our service. 8. I've used other appraisal tools in the past, how are you different? We are vastly different than other appraisal tools. 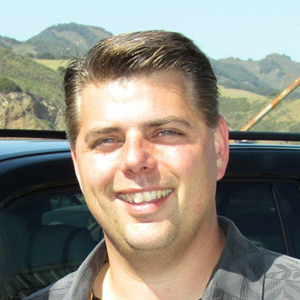 If you compare our estimates to the top sales from industry leaders such as Rick Schwartz and Mike Mann, you will see that our estimates are highly accurate. Don't take our word for it. See for yourself. Below are top industry sales from Rick Schwartz, aka "The Domain King". Actual Sales Price: $3,000,000 plus royalties, plus 10% ownership. Below is a list of publically released sales from Mike Mann for one month in 2018. We are up to 12.8 times more accurate than our closest competitor. While we were off by half on some estimates, we are still within the range of what we call "in-the-ballpark". What is "in-the-ballpark"? We consider a price "in-the-ballpark" when you can double it or half it and still come up with the sales price. But we also equally outshine the competition in estimating names with low-value. Competitors like GoDaddy Appraisals will give a relatively high value to nearly any combination of English words that you type into the tool. For example, OfficeCucumber.com, which makes no sense, is listed by GoDaddy Appraisals with a value of $1,131, but really should have no value. You'll find that our estimates are refreshingly accurate for low-value domains. This is perhaps the most important benefit to using our service, because the more names you drop that are unlikely to sell, the more money you'll have to invest in great names. Those great names will bring your next huge sale. 9. What extensions / TLDs do you currently support? We currently support estimates for ".com". Once we've reached version 2.0 in July/August 2019 and our ".com" estimates are at an even higher level of accuracy, we plan on rolling out other extensions that have achieved sales beyond a certain threshold. Most likely we will start with ".org", and could possibly include a select number of the most popular New gTLDs. Still have questions? Ask us. * Any action you take based upon the information found on this website is strictly at your own risk. You must gain business knowledge and apply your own judgement to all investments, including domain names investments to avoid financial losses. NameWorth will not be liable for any losses and/or damages in connection with the use of our website.